Financial aid is intended to help qualifying students pay for college expenses including books, fees, transportation, and other educationally related costs. 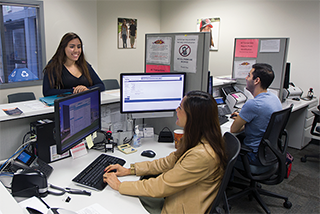 The IVC Financial Aid Office encourages students to become informed about the variety of aid programs available to them. Prove financial need based on federal and state guidelines, for need-based programs. Be enrolled as a regular student working towards an eligible degree or certificate. Not be in default on any educational loan or owe a refund on an educational grant. Have a Social Security Number for federal aid only. State financial aid does not require a Social Security Number. Register with the Selective Service System (applies to male students only). To apply for financial aid, students must complete the Free Application for Federal Student Aid (FAFSA) online at fafsa.gov. The FAFSA is used to determine eligibility for all state and federal financial aid, including the California College Promise Grant (BOG Fee Waiver). AB540 students can complete the California Dream App. Both applications open October 1 each year; students should apply before March 2 to meet state Cal Grant, IVC Foundation scholarship and priority funding deadlines. California College Promise Grant (formerly known as the Board of Governors Fee Waiver): A program for California residents attending a community college. The fee waiver pays for enrollment fees for eligible students. It does not cover parking, lab, material, or health fees or the ASIVC activity sticker. To apply for the fee waiver ONLY, visit https://bog.opencccapply.net/gateway/bog?cccMisCode=892. Student has a disability and applied for reasonable accommodations, but did not receive services in a timely manner. Student has made significant academic improvement. Student has experienced extenuating circumstances (e.g. accident, illness or other circumstance beyond the student's control). Student requests special consideration because they are receiving CalWorks benefits, DSPS, EOPS, Veterans, or Foster Youth, or homeless services. Student has not enrolled at IVC or Saddleback College for two consecutive primary semesters (fall and spring) since becoming ineligible for the CC Promise Grant. Student was unable to obtain essential support services. Students must submit their appeal to the Office of Admissions and Records. More information can be found at http://admissions.ivc.edu/pages/priorities.aspx. Cal Grant: A state-funded grant program for California residents. All Cal Grant award offers are subject to the approval of the final state budget. First-time applicants need to complete their FAFSA or Dream App by March 2 each year, and submit their GPA information. For more information, please visit www.csac.ca.gov or the Cal Grant page on the Financial Aid Office website. Full-Time Student Success Grant (FTSSG): A state funded grant program for full-time community college students already receiving a Cal Grant. Federal Pell Grant: A grant program for students who have not earned a bachelor's or professional degree. Students must file a FAFSA and demonstrate financial need. Federal Supplemental Educational Opportunity Grant (FSEOG): A program that funds grants based on demonstrated exceptional financial need. Priority is limited and given to Pell Grant recipients who complete their FAFSA by March 2. Federal Work Study (FWS): A program that funds part-time job opportunities to students with financial need. Students must be enrolled in at least 6 units. Funding is very limited and is awarded on a first-come, first-served basis. Federal Direct Loan Program: Long-term, low-interest loans from the US Department of Education. Students must be enrolled in at least 6 units and must complete a FAFSA. Irvine Valley College offers scholarships through the college's Foundation Office and generous donors. Students may be awarded scholarships on the basis of academic achievement, financial need, and campus or community service. Scholarship information is available at financialaid.ivc.edu. Scholarships are also available from sources beyond Irvine Valley College. Additional information can be found on the IVC Financial Aid Scholarship page. Maintain a 2.0 cumulative district GPA. Complete 70% of all classes enrolled. Complete associate degree by 90 units of enrolled coursework. Not have an AA, AS, bachelor's or higher degree. Students not meeting the above academic standards may be suspended and will have to submit an appeal for possible financial aid reinstatement. For more information, visit the Financial Aid Office website. When a recipient of federal student aid (Title IV grant or loan) withdraws completely from the college before completing 60% of the enrollment period, federal law requires repayment of part of the aid received. The amount that must be repaid will depend upon the percentage of the semester completed. The Financial Aid Office will notify the student regarding the amount owed and repayment options. Any aid recipient who needs to withdraw from any or all classes should contact the Financial Aid Office first before dropping. More information on the effects of aid recipients dropping classes can be viewed on the Financial Aid Policies & Procedures page of the Financial Aid Office website.